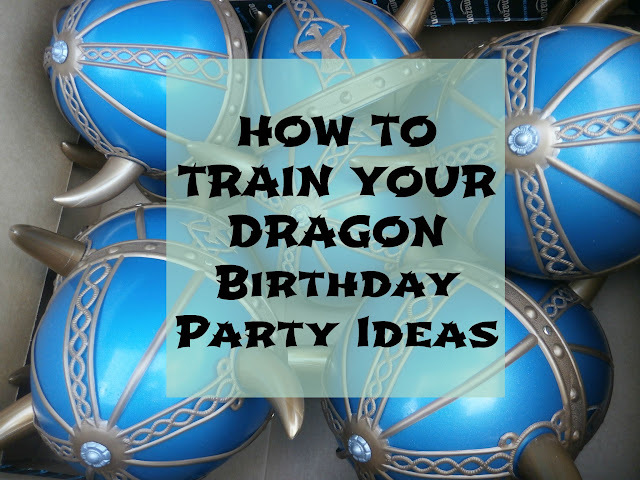 We've watched the How To Train Your Dragon movies, listened to most of the books, and picked out a Toothless Dragon Halloween costume for this October, so I wasn't surprised when I found myself planning a Dragon party. The movies are not as popular as they once were and this made it a bit difficult to find all the party supplies but with a bit of luck and determination we pulled off a great party! Each child picked/ made up a viking name for themselves; we had a few destroyers and crushers running around. They each got to decorate their own shield. I found black foam core at the $1 store and we just them into circles. I then used duct tape to make the handles on the back. We used stickers, metallic markers, crayons and colored pencils to decorate them. We used watercolor crayons to paint the kids faces for battle. Most of them chose to draw lines or weapons on their foreheads. We hung paper dragon posters throughout the yard and gave each child a can of silly string to go hunt the dragons. Of course they also had a great time spraying each other a few of the adults too. They found all the dragons and COVERED them in silly string! I made some yarn pompoms and glued a sheep face onto each one. We then bought three $1 bins at the dollar store and set up a sheep toss station. The kids all took turns trying to get the sheep in the buckets. Our basket toss set up. I decorated our hula hoop with yellow and orange streamers to make it look like a ring of fire and offered to hold it up for the kids to see if they could get the flying Toothless toy through the ring. They ended up deciding to just play with the Toothless toy; winding him up, letting him fly and trying to chase him/catch him. It was a pretty cheap plastic toy where the kids had to wind up the elastic like a toy plane and it broke in no time (wish I had read all the reviews on-line before buying!). It was a bit disappointing but the kids did have fun while it lasted. Mostly, though, the kids all had a ball running around the yard with their viking helmets, homemade shields and a toy weapon from one of the boy's toy bins. We bought these toys viking helmets for the kids in place of goodie bags. On top of the few supplies we found at the dollar store, grocery store, and those already listed with Amazon links. We also bought a few other goodies from Amazon for the party. Stickers for the shields that were also How to Train Your Dragon themed. We bought this Room Kit to use for the dragon cutouts and shield decorations for the sheep toss game. We also used the large posters on our doors. I just love coming up with catchy names and fun names for party snacks. I even make up little labels and try to stick to a color theme for the serving platters and plates. the mixture out onto wax paper to dry; sprinkling them with colored sprinkles before they dried. Thanks. I LOVE planning my boys parties because I get to tap into that creative side... and I know I only have a few years left before they're not going to want them anymore. I LOVE your how to train a dragon party. What fantastic ideas.